Create a new account at Research Nester to search and buy strategic market research reports. The position and proximity sensor is used for the determination of object which has moved to particular critical distance. It is used for the detection of nearby objects without any physical contact. The object to be sensed is known as the target of proximity sensor. The proximity sensors convert the information of object into an electrical signal. The proximity sensors have a long service life and it is used in the places where water and oil is used. The position and proximity sensors can be used in wide temperature range. These sensors are affected by temperature, surrounding objects and other sensors. The position and proximity sensors are also used in system such as fly-by-wire aircraft system, drive-by-wire systems and injection molding machines. The position and proximity sensors market is witnessing robust growth during the forecast period. It can be attributed to the increasing automation across the globe. Additionally, the increasing demand for improved sensor systems from various manufacturing industries is also driving the market growth of the position and proximity sensors. 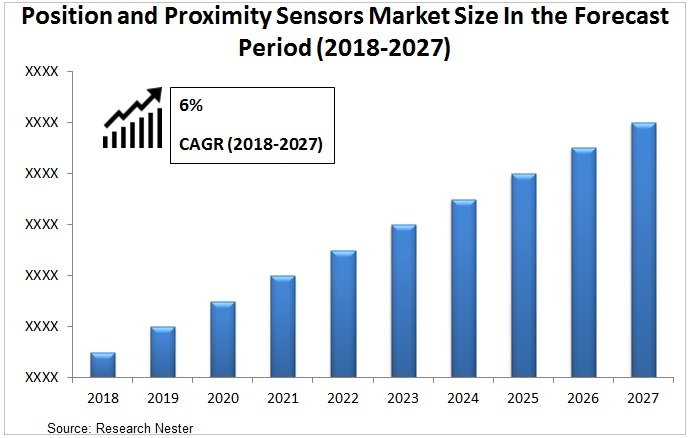 The technology advancement coupled with the development in the sensor industry is also expected to fuel the market growth of position and proximity sensors during the forecast period. The growing technological development coupled with the introduction of technologies including IIoT is anticipated to fuel the growth of position and proximity sensors market during the forecast period. The integration of technologies such as artificial intelligence and IoT (Internet of Things) in various sensors in order to develop enhanced sensors is also driving the position and proximity sensors market. The growing awareness regarding safe monitoring systems in various end-user industries is expected to drive the growth of market. The various industries are increasingly focusing on enhancing the safety and security measures which drives the demand for position and proximity sensors. The growing disposable income of population across the globe coupled with the increasing spending towards expensive products is anticipated to fuel the market growth of position and proximity sensors during the forecast period. The lack of availability of skilled technicians decreases the adoption of the position and proximity sensors in various developing regions. Thus, it is a challenge for the growth of position and proximity sensors market during the forecast period. On the basis of regional analysis, global position and proximity sensors market is segmented into five major regions including North America, Europe, Asia Pacific, Latin America and Middle East & Africa region. Asia-Pacific is anticipated to be the leading region for the position and proximity sensors market during the forecast period. The growth in the region is attributed to the expansion of various end-user industries in the region coupled with the high adoption of sensors in these industries. North America is anticipated to witness remarkable growth during the forecast period. The growth can be attributed to high automation in the region coupled with the relatively high awareness regarding sensors in the region.